The Peak Sanctuary is reached after a long but picturesque drive through pine forests. The only sign to the Sanctuary is at the main road. If you pass it, on the way up you will see the Sanctuary on the left below the hill as you go back down. 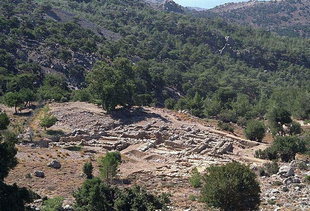 This isolated site was a place of worship during Minoan, Hellenistic, and Roman times. The Sanctuary of Hermes and Aphrodite may have provided a continuation of the cult of the Young God and the Goddess of Minoan times.